I have been in Old Town Alexandria since 1977. 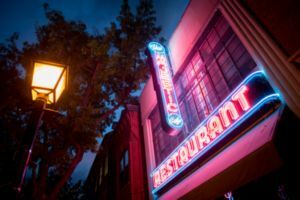 As King Street began to develop west of Washington Street, one place remained closed but the large sign was clearly visible…The Majestic Cafe. As more restaurants and shops opened down to the new metro stop, the brown paper remained in the windows of the Majestic. The Majestic Cafe is as old as the George Washington Masonic Memorial and as new as the 21st century. John Gadonas founded the original Majestic Café located at 622 King Street, in 1932. He opened the new Majestic Café at its current location at 911 King Street in 1949. Mr. John, as he was called, altered the building to enlarge the space, added an Art Deco façade, and outfitted the new restaurant with the latest restaurant equipment and furnishings. The Gadonas family closed the restaurant in 1978, but kept the building, hoping to reopen someday. That hope became a reality when a group of local investors, removed the brown paper, refurbished and reopened The Majestic Café in 2001. The Art Deco façade is original to The Majestic. Two outside neon signs that were the building’s signature were rebuilt, including one running 25 feet to the rooftop. A third sign, carried over from the original Majestic in 1932, remains in perfect working order and hangs once again inside the front window. The service kitchen visible from the dining room is where all cooking happens while the restaurant is open. A prep kitchen was added in the basement, with the area dug out completely by hand. The terrazzo floor is largely original. A team of expert craftsmen matched and repaired the original, then extended it throughout the expanded dining area. The tin ceiling on the sides of the dining room reproduces the tin design of the original Majestic. The booths and banquettes are similar to the original Majestic Café. The chairs are a 1945 Austrian design from Thonet, the company that developed the bent wood concept. The bar incorporates Art Deco light fixtures from the original Majestic. Under the new management of Alexandria Restaurant Partners (ie. 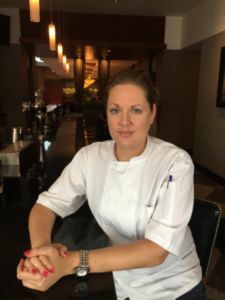 Virtue Feed & Grain), a new Executive Chef, Lisa Marie Frantz, is now on board. Chef Frantz has created a fresh menu offering classic dishes with a southern twist, with a big emphasis on what is local and in season. 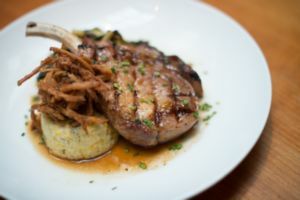 Butcher selected steaks and chops reminiscent of classic steakhouse fare are available along with fresh local seafood. Meats and produce are sourced within the greater Commonwealth of Virginia whenever possible. We were invited to a media dinner with other local “foodies” and were treated to a broad selection of menu items which made for a varied dining experience. This is a good way to get a good take on what varied palates like. The appetizers ran the gamut from Pork Candy (roasted pork belly, Virginia peanuts and hot honey), Chicken Fried Quail, Baked Pimento Cheese Dip and Blistered Okra to Roasted Jalapeno & Cheddar Corn Bread. All were outstanding other than I have to admit I am not a fan of the ever popular pork belly so I passed on it. All of the other diners raved about it. I am sort of a Georgia boy and I love okra and the okra appetizer is just right…not over cooked and a little al dente making for a bite with a crunch. The second course was the Baby Kale Chopped Salad that had roasted Belmont peanuts, apples, feta, golden raisins, avocado and sweet mustard dressing. Kale has taken over where spinach left off and we all agreed that this was a good way to serve it. served with corn pudding, collards and Coca Cola barbeque glaze; Twice Roasted Chicken that consists of forest mushroom stuffed fields of Athenry Farms chicken, Carolina gold rice and sea island red peas; and the Creekstone Ribeye served with Edwards Country ham mac and cheese. Not a bad choice in the bunch. Hard to believe that anyone had room for dessert but when they brought out the Key Lime Pie and Cherry Chocolate Cheesecake we all caved in! The wine and beer lists are fairly extensive and they pride themselves on their craft cocktails. 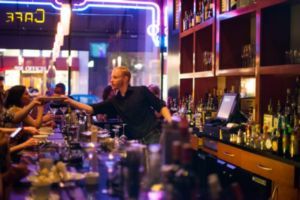 The dinner menu is a little on the high priced side – keeping in line with most of the other upscale restaurants in Old Town – but lunch and brunch prices seem very reasonable to me. 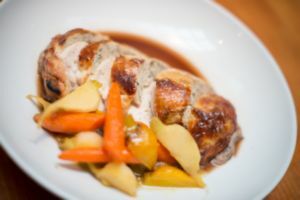 The Majestic serves lunch and dinner Sunday through Thursday from 11:30 a.m. to 10:00 p.m. and Friday and Saturday from 11:30 a.m. to 11 p.m. Brunch is served Saturdays and Sundays 11:30 a.m.to 4:00 p.m. 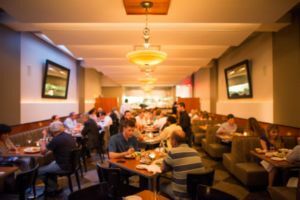 They have Happy Hour Monday through Friday from 3:00 p.m. to 7:00 p.m.
We have watched a few chefs come and go at The Majestic over the years but let’s hope that Chef Frantz plans to stay for a while. Her menu is a good one and as long as the quality remains the same caliber as what we experienced, that shouldn’t be a problem.